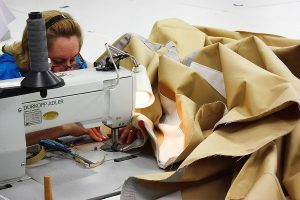 Each piece of canvas is custom sewn for your boat by our experienced team. Boats are pretty amazing pieces of machinery. A well cared for vessel can last for decades. And even a neglected boat can often be given a new life with some effort and attention to detail. Every boat owner knows that a boat is a labor of love. They cost you time and money to maintain. That’s why it’s so important to properly protect your investment. The right cover can extend the life of your boat and reduce the effort and expense you need to put into cosmetic repairs. Boat tops and canvas covers, even on the most well-maintained vessels, will eventually succumb to exposure to the sun, wind and rain. When this happens, and the time comes to purchase new boat canvas, buying from AmeritexDirect will ensure that you get the best fitting, most well designed replacement canvas, manufactured using the highest quality materials. We call this, “The Ameritex Advantage.” It’s what makes our custom-sewn canvas superior to the ill-fitting, generic covers you might find at your local or online marine retailer. If your boat manufacturer and model is listed here, it means that Ameritex made the canvas that shipped with your boat when it left the dealership. We created the original so you can trust us to manufacture brand new, identical canvas parts for you now. And the price is surprisingly affordable, especially when compared to new canvas that is custom designed from scratch. No other replacement boat canvas will have the fit, finish, and durability we can offer. No other canvas will give you the peace of mind. Know that all of the hard-earned money you have invested in your craft is protected, with a cover engineered specifically for your vessel, to keep Mother Nature at bay. That you have top-of-the-line fabric guarding your family against harmful UV rays. That no other boat canvas will give you The Ameritex Advantage.